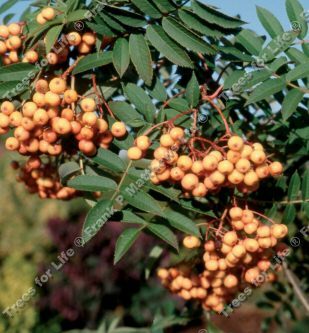 Copper Kettle (Sorbus 'Copper Kettle') is a compact, small, healthy tree with heavy clusters of dynamic copper coloured fruit that often persist well into winter. Dramatically colourful autumn leaf colours of red and orange make this a really appealing tree. Most likely to be a seedling of S. ‘Joseph Rock'. This tree is supplied at a height of between 1.2 and 2.4 metres in a 7-12 litre container for year round planting and better results than from either bare-root or rootballed stock. The size range is considerable as it depends on when in the year you purchase them and what the previous years weather has been like. 125-150cm	: 1-2 years old, supplied in a 5-10 litre pot and is a single stem. Ideal for pruning to a shape you desire. 150-200cm	: 2-3 years old, supplied in a 10-15 litre pot and is shaped as a Half Standard. A Half Standard refers to the shape it has been pruned to. When the tree was younger, it was pruned to give around half the length of the whole stem to be clear of branches and for the head, crown or whatever foliage is left to be a rounded head. In effect it looks a bit like a lollypop.